SAN MATEO, Calif. — Sept. 27, 2011 — Menlo Worldwide Logistics, the global logistics subsidiary of Con-way Inc. (NYSE: CNW), today announced its Chemical Group has been approved as a Responsible Care® Partner by the American Chemistry Council. With this designation, Menlo’s Chemical Group joins leading companies who elect to adhere to recognized industry standards, promoting the safe storage, handling and transport of chemicals. As a Responsible Care Partner company, Menlo is committed to protecting the environment and continuous improvement of chemical transportation and logistics with respect to health, safety and security of all stakeholders — employees, contractors, customers and the communities in which Menlo and its carriers operate. “Responsible Care Partner designation is a significant measure of commitment to the safe handling and management of chemicals in our environment,” said Tom Balzer, Sr. Vice President, Supply Chain Center – NAFTA for Bayer MaterialScience LLC. Menlo provides transportation services to Bayer. “We are pleased to see Menlo step up and adopt this important industry initiative,” Balzer said. “It is supportive of Bayer’s overall risk management philosophy and the high standards of business conduct we expect to help ensure the safety of our employees, customers, service providers and the environment in which we live and work. The Responsible Care Management System® (RCMS) provides a rigorous and structured framework for assessing a company’s needs, setting specific goals and sharing progress and activities with the public. Under the initiative, Menlo is required to meet the guiding principles of the program, gain executive-level support and report its progress toward meeting performance measurement goals, including the submission of annual data that is made publicly available. In addition, Menlo must receive an independent, third-party audit to verify that a management system is in place and functions according to the requirements of the ACC standards. The RCMS utilizes the plan-do-check-act continuous improvement cycle that raises the standard for industry-wide performance, while allowing flexibility to meet the specific needs of individual companies and facilities. As part of the company’s commitment to the Responsible Care Program, it must implement a system of internal and third-party certification audits to show continued compliance with the tenets of Responsible Care. For more information on the Responsible Care certification process, please visit www.americanchemistry.com. Menlo Worldwide Logistics, LLC, is a US$1.4 billion global provider of logistics, transportation management and supply chain services with operations in five continents, including North America. As a third-party logistics provider, San Mateo, Calif.-based Menlo Worldwide Logistics’ services range from dedicated contract logistics to warehouse and distribution management, transportation management, supply chain reengineering and other value-added services including packaging, kitting, order fulfillment and light assembly through a strategic network of multi-client and dedicated facilities. With more than 16 million square feet of dedicated warehouse space in North America, the Asia Pacific, Europe and Latin America, and industry-leading technologies, Menlo Worldwide Logistics creates effective, integrated solutions for the transportation and distribution needs of leading businesses around the world. Menlo Worldwide Logistics, LLC, is a subsidiary of Con-way Inc. (NYSE: CNW), a $5.0 billion diversified freight transportation and logistics company. For more information, please visit us on the Web at www.con-way.com. Kawasaki Kisen Kaisha, Ltd., Tokyo (hereinafter “K” LINE) is pleased to announce that ‘K’ LINE (INDIA) PRIVATE LIMITED (hereinafter ‘K’ LINE INDIA) will commence management of bulk carrier operations (post fixture) from India. Currently, five CVCs (Panamax and Post Panamax) and one COA contract (Panamax) have been serving JSW Group’s coal requirements. All operational work of these bulk carriers which was earlier handled by “K” LINE in Tokyo will now be handled by ‘K’ LINE INDIA’s staff effective October 1st, 2011. “K” LINE has concluded both CVC and COA contracts with JSW Group, the total now being fourteen. The vessels have been undertaking all marine transportation of Australian, Indonesian and South African coal bound to JSW Group’s facilities in India. Management of these bulk carrier operations (post fixture) from India will greatly assist customers in India. It also shows “K” LINE`s determination to extend customer-oriented services that provide prompt support and quick access for its esteemed customers. Kawasaki Kisen Kaisha, Ltd. (“K” Line), Head Office, will move from its present location with operations in the new office to start from Tuesday, October 11, 2011. 3. Fax number: +81-3-3595-5001 (main switchboard). Some direct fax numbers will change. Kawasaki Kisen Kaisha, Ltd. (“K” Line) continues to be a member company of the FTSE4Good Global Index, the leading SRI (*1) index calculated by FTSE Group (*2). This index is reviewed twice a year and　”K” Line has been a consecutive member since 2003. And also “K” Line has become a member company of the Dow Jones Sustainability Index (DJSI) (*3) as Asia Pacific Index. Global companies satisfying international standards for corporate environmental and social responsibility are selected as a members company of these Index. “K” Line will continue to endeavor to meet its social responsibilities. *1 SRI (Socially Responsible Investment) describes an investment strategy which takes account of social, ethical and environmental factors as well as financial performance. *2 FTSE Group is an independent company jointly owned by The Financial Times and the London Stock Exchange and a world-leader in the creation, management and other related business of indices for investors. *3 DJSI is an SRI index that SAM of the Switzerland and investment advisory company Dow Jones of the U.S. offers together. 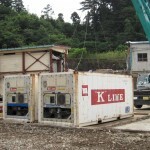 Kawasaki Kisen Kaisha, Ltd. (“K” Line) has donated five 20-foot reefer containers to Ofunato City in Iwate, Japan, which suffered devastating damage from the March 11 earthquake and tsunami, as part of its on-going support activities for disaster-stricken areas. The five reefer containers, which were delivered to four fish processing facilities in the city on September 12, are serving as temporary refrigerated warehouses for fishery products. 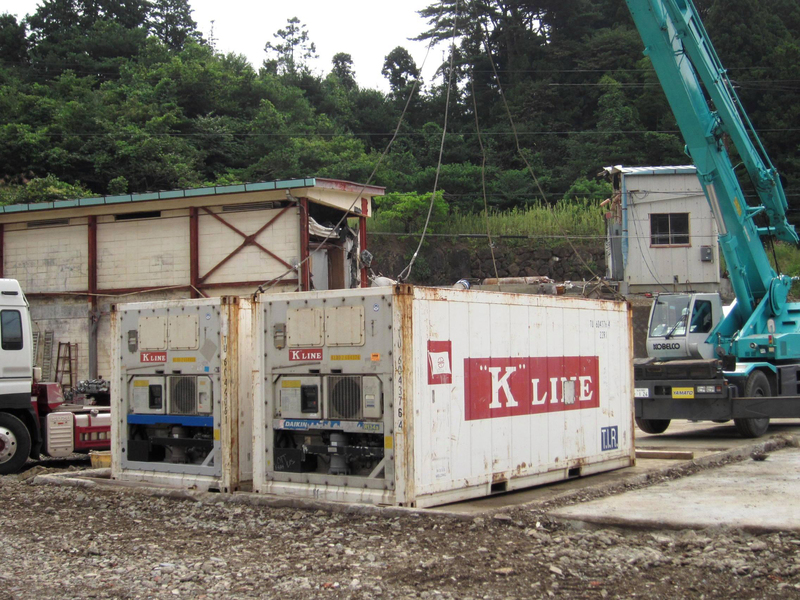 “K” Line continues to proactively take part in various relief activities in the quake and tsunami stricken areas by using its resources as a shipping company.